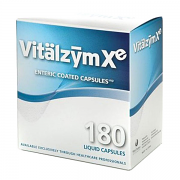 Healthcare professionals worldwide have recommended Vitalzym Cardio for their patients cardiovascular well being. The proprietary blend contains "heart healthy" enzymes that may support blood cleansing, reduced vascular inflammation, proper heart function, and improved circulation. Recent studies have shown the correlation between elevated vascular inflammation and heart disease. C-Reactive Protein levels are used as a marker for vascular inflammation. 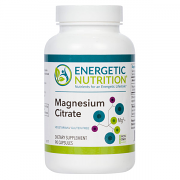 The enzymes in Vitalzym Cardio have been shown to reduce the levels of C-Reactive Protein. Stacked red blood cells (or Rouleau effect) often reflect poor protein digestion. Symptoms can include fatigue, stress on the heart, and poor circulation. Using darkfield microscopy, the ingredients in Vitalzym Cardio have been shown to significantly reduce stacked red blood cells. Below, you can see the effect of proteolytic enzymes on stacked red blood cells. Introduced in 2002, the Vitalzym line of products have become the leading systemic enzyme formulation recommended for pain management, healthy inflammation response, and scar tissue. A common benefit of Vitalzym has been its ability to cleanse the blood and a healthy inflammation response in the vascular system. 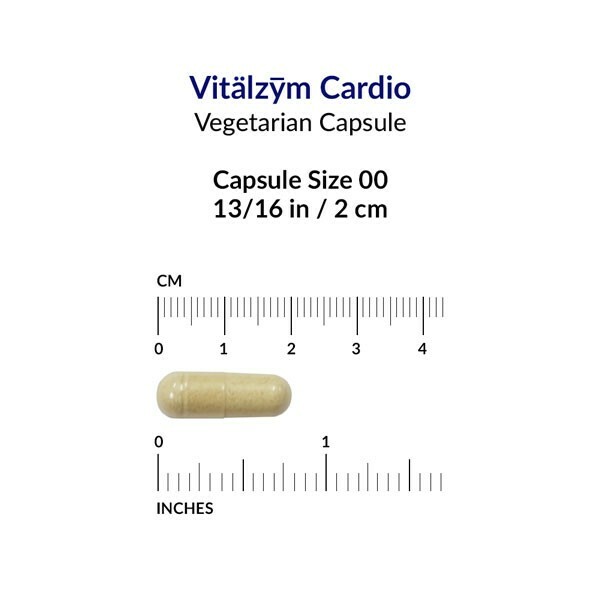 World Nutrition has taken the cardiovascular benefits of Vitalzym and harnessed them with nattokinase and other “heart healthy” nutrients to create an enzyme formulation specifically for cardiovascular wellness: Vitalzym Cardio. Why Buy Vitalzym from Energetic Nutrition? We are an Authorized World Nutrition Retailer, and one of their largest worldwide retailers. We receive a fresh supply of products every week, which is kept under climate control. We have been in business since 1996, and a trusted website since 1997. Order by 12pm PST and we'll ship the same day (exceptions may apply). Our knowledgeable staff is available to answer your questions by phone, email, or live chat. We are known for our excellent customer service and educational support. We truly care about your health, and we really appreciate your business! Vitalzym is an incredible product that helps people with a variety of conditions that often cause them much suffering. We are grateful to our customers for taking their time to share their experience and results with Vitalzym. Please note that individual results may vary in both time and experience, and that these testimonies do not necessarily reflect typical results. I just wanted to say that I think your company is just plain awesome! I will continue to purchase Vitalzym and possibly other products in the future. Greetings! Glad to report that Vitalzym really works! Thanks for offering such a great product (Vitalzym Cardio). I look forward to continuing my healthy body. I just had to order the product again, it is working wonderfully. I'm loving my first order of Vitalzym and already seeing improvement. I have suffered two heart attacks; the last one being in July of 2005. I was given four different pharmaceuticals that left me with no energy, very lethargic and still with pain in and around my heart. My wife had been using Vitalzym with great success and thought I would benefit from Vitalzym Cardio. I am now back on the golf course and have a quality of life that I have not had in a long time, including no heart pain! I attribute this to the Vitalzym Cardio. Thank you for carrying such a wonderful product. Is Vitalzym Cardio the same as Vitalzym SEB? Vitalzym Cardio is the same product as Vitalzym SEB. Only the name has changed. Enzymes are protein molecules, composed of long chains of amino acids. Enzymes are the biocatalysts necessary for the chemical reactions associated with breathing, growth, reproduction, digestion, and all other metabolic functions. For most people under the age of 25, enzymes are efficiently produced by the body to maintain optimal health. 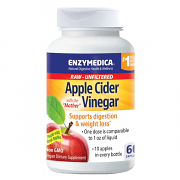 Many over 25 may need to supplement with enzymes. Systemic enzymes operate throughout the body in every system and organ. Following their absorption from the gastrointestinal tract, enzymes travel to their "site of action" in the body via the bloodstream, where they ultimately become effective. This is known as the "systemic effect." The term "systemic" indicates that the agent (in this case the enzymes) is distributed throughout the entire body. Nattokinase is a fibrinolytic enzyme extracted and purified from natto, a fermented soybean food used by the Japanese for thousands of years as a traditional food medicine. Serrapeptase is a proteolytic enzyme that is able to digest dead tissue, blood clots, and cysts. Clinical studies show that serrapeptase induces fibrinolytic, anti-inflammatory, and antiedemic activity in a number of tissues, and its anti-inflammatory effects are superior to other proteolytic enzymes. What is the difference between Vitalzym and Vitalzym Cardio? 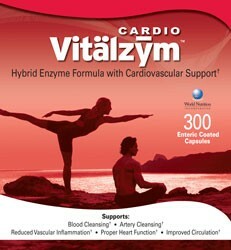 Vitalzym Cardio was formulated specifically for cardiovascular health. There is a significant amount of nattokinase in the product that may help cleanse arterial plaque. It may also help to reduce fibrin in the circulatory system and help to support a healthy inflammation response within the vascular system. 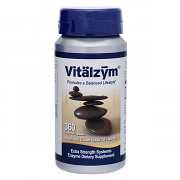 Vitalzym was formulated specifically for pain, inflammation, and systemic fibrosis. Vitalzym's chief fibrinolytic enzyme is serrapeptase. Serrapeptase has the ability to reduce chronic pain, systemic inflammation and systemic fibrosis. Is Vitalzym Cardio stronger than Vitalzym? Should I reduce my Vitalzym dosage while taking Vitalzym Cardio? There may be a small amount of crossover between Vitalzym and Vitalzym Cardio. 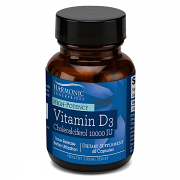 It is recommended to continue with your current Vitalzym dosage if taking it for pain and inflammation. However, one may slightly reduce their Vitalzym dosage if taking it for general well being. Why is there a caution against taking Vitalzym Cardio and anticoagulant medications? 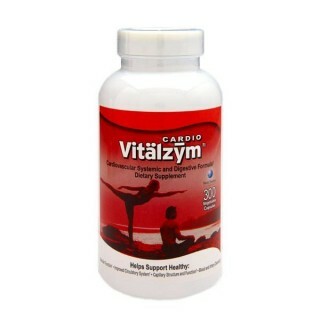 Vitalzym Cardio may help to cleanse the blood of debris and excess protein. The blood may become thinner as a result of this cleansing. Vitalzym Cardio may also help to better absorb your anticoagulant medication. You should speak with your healthcare professional before taking Vitalzym Cardio with your blood thinning medication. There have been no reports of toxicity from the ingredients, however nattokinase can significantly cleanse, therefore thin, the blood. We suggest staying within the recommended dosage. Click HERE to see full label. 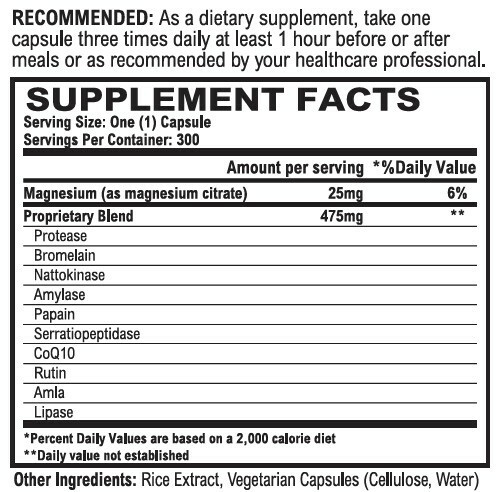 Proprietary blend contains: Protease, Bromelain, Nattokinase, Amylase, Papain, Serratiopeptidase, Co-Q10, Rutin, Amla, and Lipase. Other ingredients: Rice Extract, Vegetarian Capsules (Cellulose, Water). There is no soy in the Nattokinase. KEEP OUT OF REACH OR CHILDREN. STORE IN A COOL, DRY PLACE WITH LID TIGHTLY CLOSED. KEEP OUT OF DIRECT SUNLIGHT. Warning: If you are pregnant, lactating, taking anticoagulants or have a history of thinning blood in your family, do not take this product without direction or supervision from your medical provider. Discontinue use two weeks prior to surgery. Vitalzym Cardio is natural. 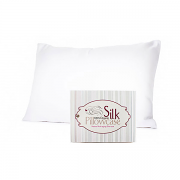 It contains no animal derivatives, artificial flavors, wheat, yeast or gluten. It is also lactose free and contains no harmful talc. Manufactured by World Nutrition, Inc. World Nutrition's products are USP grade (United States Pharmacopeia). USP is a publication established in 1820 that contains legally recognized standards of identity, strength, quality, purity, packaging, and labeling for drug substances, dosage forms, and other therapeutic products, including nutritionals and dietary supplements. As a dietary supplement, take 1 capsule three times daily, or as directed by your healthcare provider. Take capsules at least 30 minutes before a meal, 60 minutes after a meal, or any time in-between meals. Vitalzym Cardio is quite potent, and the nattokinase thins the blood, so be conservative in your dosage. Do not consume more than 3 capsules per day unless your healthcare professional has directed otherwise. DO NOT take Vitalzym Cardio without the consent of your physician if you are lactating, or currently taking prescription anticoagulants (blood thinners). As always, you should consult with a health care professional and/or pharmacist if you are taking prescription medications and would like to include dietary supplements into your regimen. If you are pregnant consult with a doctor prior to using. If you are pregnant AND have uterine fibroids, do not take Vitalzym. Not everyone should take Nattokinase and/or Serrapeptase. People with bleeding disorders, such as hemophilia or a group of diseases called "hemorrhagic diathesis", should NOT use this natural product. People with ongoing bleeding problems, including ulcers, recent surgery, recent major trauma, or hemorrhoids also should NOT use nattokinase or serrapeptase. Anyone who has ever suffered intracranial (brain) bleeding, or who has had neurosurgery or ischemic stroke in the previous six months, should AVOID these enzymes. Those with severe uncontrolled high blood pressure should also REFRAIN from taking nattokinase and serrapeptase.